Seed oil content is determined by the balance between seed fatty acids synthesis and degradation. 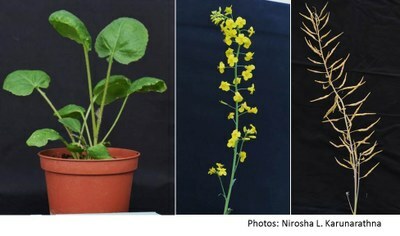 To date, many attempts have been made to increase the oil content in rapeseed via improving seed fatty acid biosynthesis. On the other hand, it has been reported that after an increase during the first 35 days after pollination, rapeseed oil content is declining to a small extent at the late stage of seed development until maturation, indicating that degradation processes might play a role (Fowler and Downey 1970; Kelly et al. 2013). In Arabidopsis, five Seed Fatty Acid Reducer (SFAR) genes have been identified, which belong to the GDSL lipase/esterase family and have been shown to be involved in the seed fatty acid reduction in mature seeds (Chen et al. 2012). Due to the close evolutionary relationship of Arabidopsis and Brassica napus, we started to investigate the effect of corresponding homologous gene copies on the oil content in rapeseed. In this project, we follow two knock-out approaches using classical TILLING in an existing EMS (ethyl methanesulfonate) mutated winter rapeseed population and the CRISPR/Cas9 technique. By in silico analysis, 12 homologous genes were identified in B. napus genome for 5 known Arabidopsis SFAR genes. Based on the relative expression values, 6 paralogs were selected for mutation screening by TILLING. Single mutants are combined to produce double mutants expecting pyramiding of mutated bnsfar genes could increase the seed oil content significantly compared to the single mutants. The CRISPR/Cas9 system was employed to generate mutations in all 12 paralogs in each BnSFAR subfamily using a common subfamily-specific target region. Agrobacterium-mediated hypocotyl transformation was used for plant transformation. Until now, transformation efficiency is between 0.1- 1.1%. We identified InDels mutations in T2 plants for some of BnSFAR paralogs. Oil content and fatty acid composition will be measured in the T3 seeds after having fixed the genotypes in T2. The project is a joint Sino-German research project.